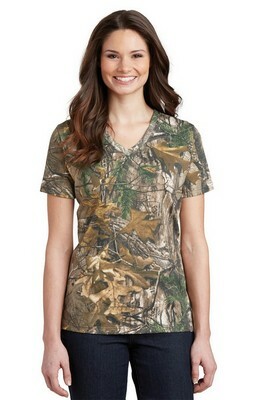 This Russell Outdoors Realtree Ladies 100% Cotton V-Neck T-Shirt has pigment dyed special camo print and your company logo. 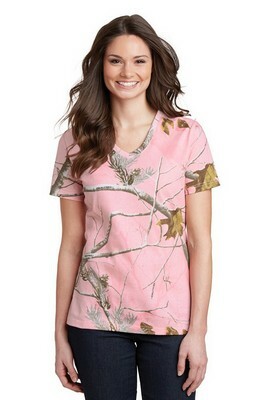 Your hunt for a fashionable, feminine camo tee is finally over! Russell Outdoors Realtree Ladies 100% Cotton V-Neck T-Shirt has pigment dyed special camo print that is looks very feminine too! Made with 5.4-ounce, 100% cotton jersey, this tee has a rib knit V-neck, side seams and a contoured body for the perfect feminine fit. The tee comes with a tag-free label but has a Russell tag on the hem. The sturdy tee can take what you throw at it with its double-needle sleeves and hem. Customize this tee with your logo and watch your promotional targets go wild!